David Chiarelli - Latest Edition! : ETFO EC's: What Sam Said! 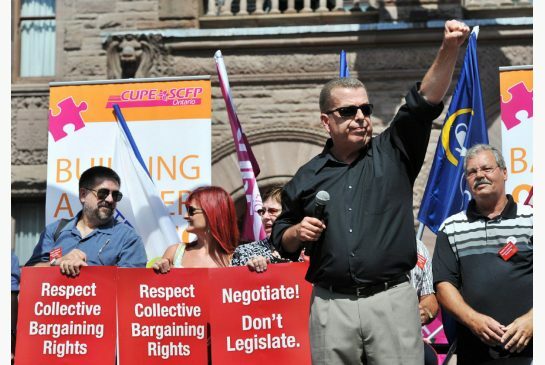 The Toronto Star has not published ETFO President Sam Hammond's response to a member's open letter against the union leadership from last week. It is most nefarious that the newspaper will not print both sides to the story, which they harshly editorialized with an anti union stance towards the EC issue. ETFO continues to fight the good fight! It has been said that "freedom of the press" belongs to those who own the press. Hopefully with our new social media those who disagree or have another point of view can no longer be silenced. We await with interest to see if the mainstream media will also "choose" not to acknowledge the ETFO member's open reply, also included at my same blog link. It is unfortunate that your characterization of our union implies that the will of many members is somehow divorced from its leadership. The reality is that, like other democratic institutions, union representatives are elected and serve at the will of their members. ETFO members across the province have personally opted to take the only action available to them to protest the loss of their democratic rights through the withdrawal of voluntary/extracurricular activities. While the vast majority continues to urge their union to support those actions, others such as Ms. Beattie wish to do otherwise. As disappointed as parents, students and teachers may be at the current impasse in government discussions, the implementation of Bill 115 under the previous premier and education minister has created huge ramifications for working people and students who will one day enter the workforce. The responsibility for the current situation rests squarely with the provincial government and only that government can implement the change that will restore peace and stability to our schools. This impasse in the education sector isn’t about gaining more money; it is about the loss of democratic rights, and the wilful disregard for provisions put in place in previously agreed-to contracts. One of the few democratic processes that working people have in their defence is the right to collectively bargain. It is a right that various provincial governments, the federal government, and other corporately-driven interests have taken steps to diminish or destroy. That an overwhelming majority of ETFO members support our advice and are personally choosing to stand up for these fundamental rights by making very difficult decisions speaks to the seriousness of what is at stake. You can send your own letter to the Toronto Star @ Write a letter! Kindly note this is an unofficial all affiliate teacher union newsblog. I don't represent ETFO or any other union in any official way, shape or form, except in my own solidarity as a fellow teacher. The views expressed are mine. I love you Sam Hammond. You the man! It takes gumption to stand alone against tyranny! Hi David. Have you had enough of the Liberals and the Toronto Star by now? Despite your past work alongside Liberal politicians I would point out that when they were not busy paying off teachers and their sychophantic unions, the Liberal party was passing back to work legislation on ttc workers, holding up college professors via the OLRB, holding secret meetings to take away the rights of citizens to protest, and lets not forget the waste of billions of taxpayer dollars. Did I mention they also have secretly privatized many crown agencies? See the Liberals for what they are. It is in your face. Given a chance all 3 main parties have shown that they will screw us over. What would you suggest? There you go again, only thinking about teachers. I'm talking about corruption and corporate control of our political process and you are worried about poor teachers being screwed over. Wynne is going to privatize our lottery and defund public pensions. Can you believe that? You are missing the point. All teachers need to boycott the Toronto Star...cancel your subscriptions, and don't use it in any classes...it actually used to be the best paper. Time to boycott it. If it won't cover all sides of a story equally it is biased. Vote Green or NDP or Commie but stop helping those corrupt Liberals David. It ain't Christlike. You know, Mr. Social Justice/Solidarity himself. Ok vote Jesus then but stop with the Liberals and save your soul. As a regular visitor to your blog, I'm always interested in the perspectives offered in the comments section, by others, with respect to your opionions. I'm seldom personally offended by criticism and even more rarely concerned about criticism levelled at those who choose to share their opinions in a public fashion - but in the case of the last post by "Anonymous" (March 19 - 19:07), I feel compelled your express my distaste. It is entirely fair for your readers to disagree with you - you have stated so repeatedly and consistently back that up by posting comments that question your position or judgement. It is not fair, or appropriate for commentators to engage in snarky name-calling or to suggest that your beliefs (clearly NOT the same thing as opinions) are not heartfelt or lack integrity. "Anonymous"... please stop. If not... kindly post your name so that the rest of David's readers can assign our own judgements regarding your "opinions" without the risk of mixing you up with all of the other "anonymous" commentators out there in the blogosphere. Never vote Green - they are anti-Catholic. The Ontario Greens are downright scary. Never vote 4 them period. Politically they are so far to the right they make Tim Hudak seem like Naomi Klein. I've never quite figured this out; in most, if not the restt of the world, they are usually leftist, except 4 here. Folks will park their vote their vote there perhaps on an iisue like the Catholic schools. More often I suspect it's out of frustration 4 with everybody else. The voters will think it's an environmental group, which is a motherhood issues most rational people can support. Tt's sort of like kicking hte tires without looking under the hood. There are never enough aggregate voters naywhere for them to win a seat, so far. Maybe if they did they would be exposed 4 what they are .... really scary far far right. My blogspot Comments section seems to have a way of self correcting itself whenever anybody crosses the line with an inappropriate comment or attack. However, I agree with the writer 3 comments above. I will expect the writer in question to post their name for the reasons given. Otherwise, I know a lot of the contributors here enjoy being able to comment openly + freely without any fear or constraint for many reasons. Sometimes its a political newbie just eager to jump in the fray. Othertimes it might be somebody in a delicate situation or position here within our many various Ontario teacher, union + political circles. Often folks let me know in person, by email, or I can tell by their comments whom they are anyway, but I haven't required it. We enjoy a good level of interesting and thought provoking discussion, be it from our grassroots classroom teachers to other union and even political figures who might otherwise be well known names. It's much more dynamic if we can speak freely. There aren't really a whole lot of opportunities anymore where everyone can just openly share a thought or valuable insight 4 reflective and discussion purpose. I wouldn't ever want to upset that balance. I always identify myself and don't care if you know who I am or not. I am either very confident that way, or perhaps I just have very tough skin. Anyway, at this stage in my career, thats just what I have chosen to do. And as noted, you are quite free to share contrary thoughts + ideas here. I do not take offense whatsoever. I even quite enjoy the interesting thought process and discussions that follow 4 the reasons I've frequently stated. Be that as it may, should anyone one want to use their name too, I believe you can do so using the "Comment as" box that appears below before you post. It's different 4 me as site administrator but I believe that is how it works. As you might've noticed, others have chosen to use a nom de plume just for constistancy sake or whatever the reason. You can do that too.